Shanghai; enticing, exotic and charismatic. A large metropolis filled with a mysterious history, and a vibrant energy today. So much to see, so much to do, so much to learn. So how best to explore as much as possible in just three days? We recently spent a long weekend there to find out. Shanghai skyline, overlooking The Bund. There are a few areas to stay in Shanghai, and arguably the most popular with tourists is close to The Bund waterfront. Traditionally the city’s commercial and financial hub, here you’ll stay close to the water with its iconic skyscrapers, such as The Pearl TV Tower. This is the Shanghai of the brochures. Southwest from here, and a short 20 minute taxi ride away is an area called Jing’An, where we decided to base ourselves in the beautiful Shangri La Hotel. Jing’An in its current demeanor is a modern development, but is closer in spirit to the beating heart of the city. Sure, you’ll find skyscrapers here too, but the area also has historic landmarks and a local vibe. 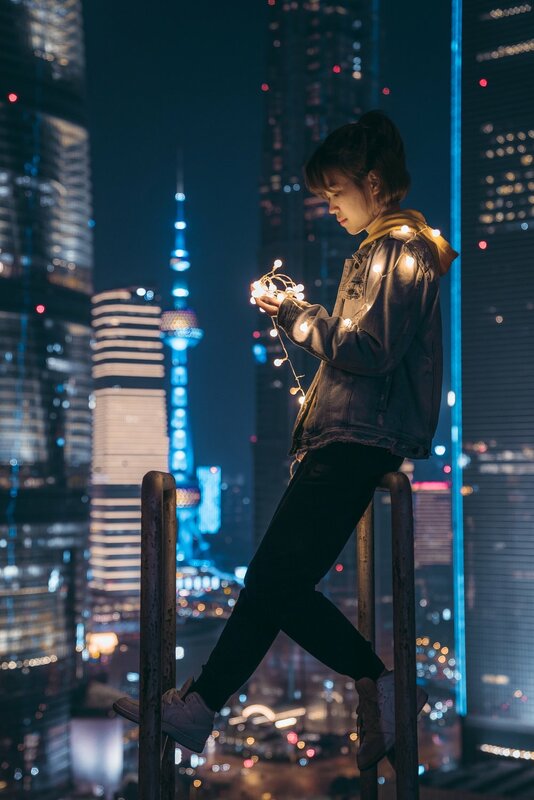 Many of Shanghai’s younger generation and expat population live and work around this area, giving it a cosmopolitan feel and an electric energy. The following guide can of course be tailored based on your choice of location, but by our reckoning, Jing’An as a base worked pretty perfectly. Shiny on the outside, but an area steeped in a mysterious and sometime bloody history, this is the home of the raucous Shanghai of the early 1900’s. A former play area to gangsters and foreigners alike, famed for its carefree attitude and occasional opium war. Start your day relaxing with a walk in Jing’An’s local park. Shanghaians, and indeed Chinese all over the country seem to have a love affair with parks, particularly in the mornings. Jing’An Park is no exception. Wander through and watch as men play chess at specially installed tables inside the park’s gardens, noting the crowds surrounding them to bet money on their hopeful winner. Turn a corner and see men and women of all ages, delicately practicing Tai Chi, twisting and turning gracefully with every change of chord in the music. Sit yourself down on a bench and watch as a group of elders appear for music class and begin playing the most beautiful Chinese pipe music, every now and then bursting into spontaneous laughter as one member of the group plays a wrong note (un-identifiably wrong to our untrained ears, we'd add). Sit, stay a while as the peaceful morning wake-up activities change to a more energetic dance group, swinging, twisting and shaking to the music they’re playing from a boombox. Feel the energy; dance, clap and you’ll be soon be welcomed with inviting smiles to join in. Jing’An is an area rich in history, with landmarks to match. Once such is The Paramount Building, a stunning example of Shanghai’s famed Art Deco style. This former 1930’s ballroom and nightclub is the epitome of early Shangai’s ‘fancy and free’ attitude. Back then, this building was known then as ‘Bai Le Men’, meaning the ‘Gate of 100 Pleasures’ in English - so it’s not hard to imagine what went on here during its heyday. This was the place where in the 1930’s, as traditional attitudes changed, local gangsters mixed with foreign girls and opium wars played out. Sadly, today the building is closed to the public but just standing outside it, the stories come to life. A Buddhist temple, with a commanding golden exterior this is both a stunning building and an active place of worship for many locals. Tourists are allowed to enter, even as worship takes place, so can observe as incense is swirled and prayers are said. The temple is fairly sizable so do wander around the different levels, entering into areas as permitted. A peaceful atmosphere surrounds the prayers despite the large numbers of people inside. Of course, be wary of where you point your camera and take heed of areas with ‘no photography’ signs. The French Concession is a short 10 minute walk from Jing’An and, while home to many of Shanghai’s French community back in the 1920’s, it also had abundant British, Russian and Jewish communities which influence its appearance. The area has an intrinsically more European feel, and has often been named ‘the Paris of the East’. Buildings are generally just a few stories high and set around leafy streets, all built in the style of the time - keep your eye out for many stunning examples of Art Deco architecture. Wandering around this area, it may feel that a lot is closed off and you’re only able to see it from the outside. We urge you to walk down the back streets and look for signs inviting you into buildings - many of them today house art galleries, museums and exhibitions where you can learn a lot about the history of the area. The French Concession is easily walkable with many impressive buildings to observe. We recommend stopping for coffee and croissants as you walk; Baker and Spice is a popular expat breakfast hangout. As evening hits and hunger strikes, YongKang Road is the place to head. Close to the French Concession, it’s walkable (or take a taxi if a day exploring has tired you out). This road is another filled to the brim with Shanghai’s younger generation and expats. Here, you really have your choice of where you want to eat, drink, and party the night away. From western cuisine, to local delicacies, and some really good sushi. We spent the evening in a cosy corner of Sushi’O eating hotpots and drinking sake. The perfect antidote to a long day of walking. Refreshed and energised we hot-footed it to nearby bar, Monkey Champagne (Donghu Road). A semi-secret bar, you'll find it tucked away behind the more visible restaurant, Bonobo. Once in, we danced the night away with Shanghai’s cool crowd, listening to underground DJs and drinking delicious cocktails. Staying in Jing’An doesn’t mean there isn’t a lot more to explore outside of it. After a hearty Chinese breakfast in the Shangri-La’s executive lounge, we set out to Pudong. A twenty minute taxi ride from the hotel, this is the Shanghai you’ve seen in magazines. Skyscrapers competing for attention, the refreshing Bund waterway cutting through the heart of it, and plenty of top-notch restaurants and bars. Famed for its spaceship-like architecture, this is the most famous building in the city. Situated in Lujiazui, Shanghai's financial district, this stand-out building really is designed like no other. Used as a TV and radio broadcast base, it’s also one of the most frequented buildings by visiting tourists - but don’t let the queues put you off. With commanding city views from both levels, the lookout areas will take your breath away. A glass floor runs around the outside of the domes, from which you look down to the busy intersection below. From high up here people, cars and trees look like mere dots, reminding you just how high you are. Many people use the opprtunity to lie down on the glass for a photo, and it’s a great Instagram photo! We did just this (see right), only to be greeted by a young boy jumping up and down, notably shaking the glass and laughing hysterically as we quickly got up and decided it was time to head back down. The Bund is a waterfront area, and another of Shanghai’s most recognisable features. Stepping out of the Oriental Pearl Tower, you can’t miss the scores of companies trying to sell you tickets for a boat ride along it. We recommend you do. A fantastic way to see the famous skyline from a different angle, and to spot some incredibly interesting buildings along the way. Of course, this trip also offers some space and refreshing respite from busy city life. Pudong is home to many of Shanghai’s five star restaurants and bars, so whilst in the area do stay and try some of them out (we recommend a quick brush of the hair, powdering of your nose, and a change of clothes before dining). Many of the restaurants will need to be booked in advance, so do some research and decide what you fancy a day or two before your visit. Most face the city skyline, including a view of the Oriental Pearl Tower. As day turns to night Shanghai’s skyline really comes to life, with a multitude of neon colours lighting up the buildings. We dined at Hakkasan, and devoured many different dishes, though a personal favorite was their Ma Po Tofu, the flavours of which really cannot be put into words and was unlike any Ma Po Tofu we’ve eaten before. Hands down, the tastiest meal we’ve ever eaten thanks to the incredibly fresh ingredients they have access to in the area. After dinner, there are plenty of fantastic bars nearby. We chose Bar Rouge for its commanding roof-top views over the skyline, followed by uber-cool ‘The Nest’ with a who’s who of Shangahi clientele. We can’t promise the same, but our evening here result in making some lifelong friends, all brought up in Shanghai. Fantastic. After a slight lie-in (perhaps something to do with all those cocktails! ), we booked an 11AM tour. But this was a tour with a difference as it was conducted from a motorbike sidecar! Shanghai Insiders is a local tour company, run by long-term expats who really know their city and offer tailored tours and information, dependant on your interests. With an affinity for architecture we decided on another visit to the French Concession, this time stopping at some of the most interestingly designed buildings, or those with deep historic meaning. Helmet on, strapped in, and off we went. Our guide was fantastic, really knew his subject, and even had a small carafe of wine ready for us upon one of our stops. This is certainly one of the more interesting ways to see the city! With one final dinner to squeeze in before leaving, and determined to eat like a local, we took recommendation from a friend and ex-Shanghai citizen. Described by him as a ‘Muslim noodle bar with a blue sign’ and ‘the best local food you’ll find’, the hunt was on. It wasn’t easy, and many blue signs took us to some interesting places including a pharmacy and a typewriter store. But, we found it in the end, took a seat at the low table and ordered as much as we could possibly eat. It was a case of point at the Mandarin menu and hope for the best - so while the food was absolutely worth the search, you’ll have to choose which dishes to dine on for yourself. This is a chain, so you have some chance of finding it, wherever you may find yourself in the city - we wish you luck on your search! Taxi travel: if taking a taxi, have a local write down both your destination and your return address before leaving. Most taxi drivers don’t understand English so will need to read these instructions instead. Hotels are very used to this practice and will happily oblige. Language: learn a few words in Mandarin, even if it doesn’t get you far the locals will appreciate the effort. Tipping: this used to be very rare but is becoming more common, and as such is at your discretion. A 5% tip would be more than enough to show gratitude. Online access: generally online access is good in Shanghai, though be aware that many social media sites are blocked, including Facebook and Instagram. Of course, there are ways around this, but we leave that decision to you. Scams: these are becoming less frequent, but still around. Be wary of strangers approaching you to offer tours, or following you around in markets. Know anyone considering a trip to China? Share this itinerary using the social icons at the bottom.